It was Seneca College Day at #Bloomtools this past Wednesday, as students of Dr. Malak Attia were in our offices to learn about the business side of #digitalmarketing. Not only did they learn about Bloomtools, its products and services, but they were also exposed to Bloomtools' secret sauce - the 5 Ps of internet marketing - and participated in a collaborative #websitedesign effort. These students were very engaged and asked lots of pointed questions, and that attests to both the quality of the students and the quality of their programme. We had a special guest star - Esther Willinger, President of Eden Advertising & Interactive - to cover online advertising. Special thanks to Sherif Youssef of The One Business Consultants for coordinating the efforts between Seneca and Bloomtools. Should you focus on SEO or PPC to grow your business online? Should you do both? PPC - aka Pay-Per-Click, Paid Search, Online Advertising, SEM - is an effective way of promoting your business and generating leads through advertising. 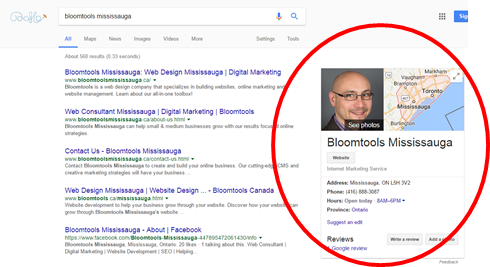 This month's tips on how to be found online was created by Bloomtools, and is supported by our blog 4 Easy SEO tips to be more visible online.